Two potential ballot questions to increase minimum wage in Massachusetts and ensure paid medical and family leave have been approved by Massachusetts Attorney General Maura Healey to start signature petitions, Andrew Farnitano, a spokesperson for Raise Up Massachusetts, said. The signature campaign is one in a series of steps to get the two initiatives on the 2018 ballot in November. This is the most recent advancement in the fight for greater workers’ benefits led by Raise Up Massachusetts, a grassroots coalition that works for better wages and benefits for workers, Farnitano said. 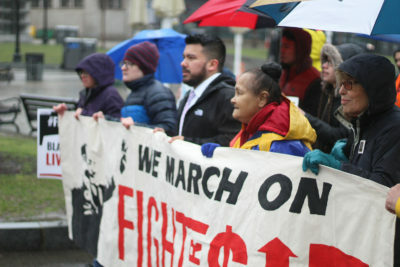 Farnitano said the first signature petition for a $15 minimum wage addresses the plight of minimum wage workers who cannot survive on the current $11 minimum. If approved, the resulting ballot question would enact a one-dollar increase in minimum wage over four years to $15 by 2022, according to the official website for Raise Up Massachusetts. Farnitano said the second petition will create a paid family and medical leave insurance program in order to ensure people can take care of themselves and their family, whether they just had a child or have fallen ill.
Farnitano said putting these initiatives into practice will not only help those individuals, but the Massachusetts economy as a whole since the extra money workers get will go into local businesses and their community. “That’ll help us grow from the bottom up,” Farnitano said. The signature petitions will begin this weekend, requiring a minimum of 64,750 certified signatures each to appear on the ballot in November, according to the official site for Raise Up Massachusetts. However, Farnitano said the organization will work to secure at least 120,000 signatures on each of the petitions in order to guarantee all of them check out. Vanessa Snow, the council organizer at the Greater Boston Labor Council, said she hopes laborers standing in support of these petitions will remain active in the community even after the campaigns are over. “We’re hoping as we are working on this campaign and showing solidarity with fast food workers, or food service workers, that they will also see value in engaging more deeply and using their leadership skills in developing and joining the labor movement,” Snow said. Snow said the petition for paid leave will be particularly advantageous to women in the workforce. “This is an equity issue and child care and healthcare are huge barriers for women … advancing in their work and being able to provide for their families,” Snow said. Several Boston residents said they agreed providing greater benefits for workers in Massachusetts would be a good idea. Ray Xiong, 32 of Brighton, said increasing the minimum wage will bring positive changes to the city. Matthew Marshall, 34 of Brighton, said increasing the minimum wage and giving paid medical and family leave will benefit the city. Emma Kawski, 21 of Allston, said she thinks the current minimum wage is not sustainable. “I’m not sure how much it adds up to when you’re working full time, but it’s not living conditions at all,” Kawski said. Kawski said she thinks current regulations regarding paid leave are restrictive. “I recently met a couple who were able to walk away from their jobs at 24 and 25, but I’m on a different path right now because … I don’t want to put in a notice to go see someone in my family that’s sick,” Kawski said. Jordan Kimmel contributed to the reporting of this article.